One of the most important things to consider when you’re looking to create a mold is surface finish. No matter what material or method is being used to create your mold, whether you’re machining or using an EDM system or another form of mold making, the surface finish of your mold will always affect the final parts. One of the determining factors with surface finish, when it comes to mold making, really depends on the final material that will be used in the mold, as well as the tolerances that the end user requires. For instance, materials like silicon require mirror finishes to work properly… to the point where you can’t even touch the finished piece because the residue and oils from your fingers can cause issues. Aesthetics can also play a huge role in how a mold’s surface finish is determined. Depending on what the final part is being used for and the material it is being made out of, the surface finish of your mold can dramatically change how it looks. Some molds need to be textured. For example, if you’re making a mold of a medical part, like an endoscope, which a surgeon needs to hold with gloves, you need to develop a uniform texture for gripping. Medical utensils often need to have a highly tactile capability. Grip is part of that, but something as basic as how the tool feels in your hand is important. When a surgeon is doing incredibly delicate work, they need to be able to not only hold their tools properly, but the tool should also feel comfortable in their hand. The feel that a part has can also play an important role with the marketing of a part. Within the automotive industry, a lot of importance is placed on the feel of a vehicle’s interface, which goes back to how the surface finish was created in the mold for those parts. Certain materials won’t release with inconsistent or flawed surface finishes - silicone, nylon, thermoplastics, and metal injection molding commonly require high-quality surface finishes for proper mold release. Obviously, if you want to have a well-made, molded part, it needs to get out of the mold properly. Some materials will have this issue intermittently if a mold has a cruddy surface finish, which can cause even more headaches with not only your final parts, but also with longevity of the mold. Silicone and a lot of nylon materials, both of which are often used in the medical field, have a tendency to have sticking issues, even if the surface finish is perfect. In this situation, hedging your bets in favor of surface finish in your mold is a good idea. In other words, to give yourself the best chance of getting a quality part, significant care should be taken with surface finish, even if you have to sacrifice time in the process. Surface finish can also affect the flow of you mold. As you inject a material, it’s important that the material is able to get to every crook and crevice within the mold. Surface finish can change how a material flows through a mold, possibly preventing material from reaching all parts or even (depending on the material) premature curing, leading to incomplete or inconsistent parts. When material is shot into the mold, more often than not, there is a certain window of time before the part begins to cure and solidify. If the material doesn’t cure evenly, the part can have unexpected weak spots or break apart when the mold releases. This is especially apparent if you’re dealing with thin channels in your mold. Oftentimes when mold making, there will be callouts for the quality of surface finish in a specific area. If the callout isn’t directly related to a final part’s texture (or lack thereof), this is due to how the engineers and/or operators have projected the material flow. 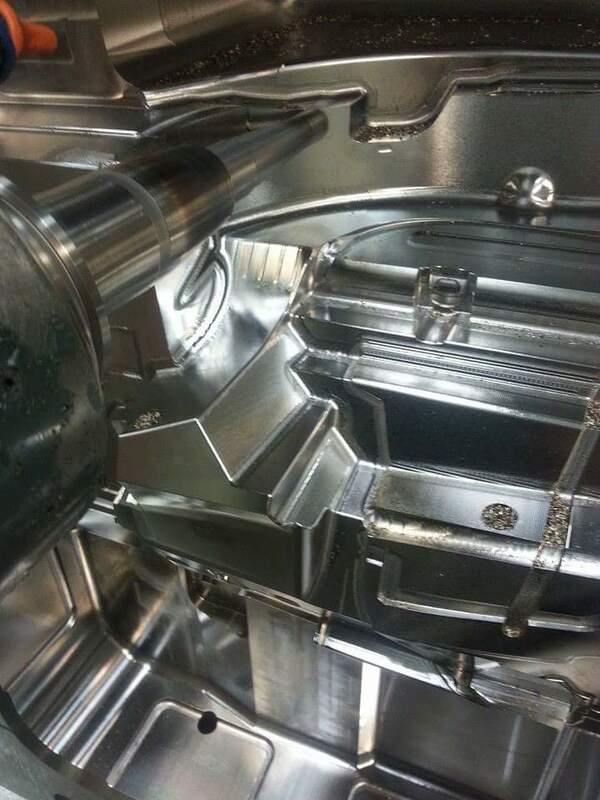 If an area has thin channels, specifically in the runners and gates of a mold, there will often be a call for a high surface finish, just to be sure that material fills the mold. A sub-par surface finish can also cause issues with splay, sometimes called “silver streaks.” This issue has the appearance of silver scratches on the finished part. Splay is caused by miniscule gas bubbles being dragged across the surface of the part when the mold cavity is filled. When a material is heated before being injected into a mold (more often than not, some form of plastic), there is often moisture in that material. As it’s heated, this moisture turns to steam as the material is heated, and the result is tiny gas bubbles in your injection material. As your part is curing in the mold, these gas bubbles work their way to the surface and cause splay. While this issue is clearly a cosmetic problem, it can also weaken a molded part. Splay can be prevented by using hygroscopic materials and checking that a material is dried completely, but sometime splay can still present a challenge. This is where quality surface finish comes into play. Vents are designed to allow the air in a mold to escape as it is filled, but with the right surface finish, those gas bubbles can be ushered to vents as well - reducing splay. 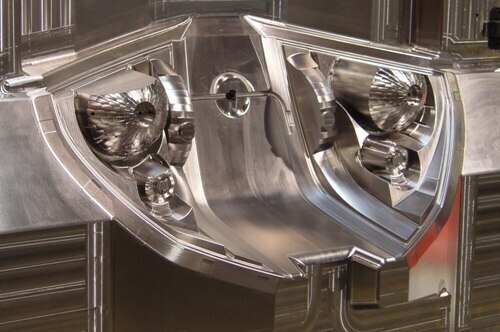 Most of the time, molds undergo an array of processes to get to their final form - an array of 3-axis machining, 5-axis machining, EDM, and hand finishing can be seen just about any mold making shop. When machining a mold, running times of 40, 80, or even 100 hours is nothing. A traditional machinist may be quite familiar with using a ball end mill to get contoured surfaces, but when you’re making a mold, it’s not uncommon to use single-point tools. These can take ages to machine a part, with a tiny stepover and high RPM, but it makes for a much better surface finish right off the machine. Typically in a mold shop situation, you aren’t thinking production - you’re thinking custom, quality parts that will then be used in production environments. Because of this, time is less of a factor than it is in a traditional machine shop, so getting the best surface finish possible with automation helps keep the rest of the shop moving. A good rule of thumb is to use the smallest stepover that your machine is capable of and that time will allow. The need for hand-finishing can vary, but because high-quality surface finish is needed so often in the world of mold making it’s a good assumption that, other than a few exceptions, almost every mold will require some hand-finishing work. Some molds will have just a few areas that are hand-finished, while other molds might require hand-finishing on the entire piece - it all really depends on the requirements of the final part. There are a number of ways to get the best surface finish possible, right off your CNC mill. Choosing a cutting technique for your situation can really affect your surface finish. In the molding industry, much like the aerospace and automotive industries, freeform surfaces are very common. Constant scallop and adaptive toolpath generation are options to keep in mind when you are CAMing up a mold. Knowing the geometry of your tools and how they relate to your toolpaths and mold geometries is important. Oftentimes, software can help you out with this challenge, but the key is making sure your CAM knows your tools. A properly set up tool library can not only save you piles of time, but it can also help your software do more of the heavy lifting. There are also a number of verification programs that you can use to double check your CAM. Tolerances within your software should also be considered, but always consider your machine. If you tell the software to hold a 0.0001” tolerance, the program will do so, but if your machine can’t hold that, you’ll end up with a much worse surface finish than if you left your tolerances at 0.001”. Even the most rigid, precise machines can have some slop (even if it is microscopic), so make sure to consider that when programming in CAM. There are a number of important elements to consider when it comes to your machine as well as important software concepts. Maintenance and upkeep of your machine. Your machine should be running like a well-oiled… machine. Without proper upkeep and cleaning, grit can get into the nooks and crannies of your ways, ball screws, and many other areas, which can cause hard-to-find vibrations and slop. Vibration is a quick way to kill a good surface finish. A good, rigid setup. If your cutting with a tiny cutter, with tiny stepovers, rigidity of your setup is vital to not only reduce vibration, but also save your tool from breakage. This rigidity goes far beyond just your machine itself – workholding, toolholding, tool stick-out and runout call all cause issues with rigidity, leading to crummy surface finish. Reducing your stepover to as little as possible, while still taking a chip (See #3). If time isn’t an issue, a stepover of 10-15% is ideal. Paying attention to where your chips will be going. Watch the cutter simulations and determine where your chips will be flying, because cutting over chips is a quick way to ruin a good finish. If you might be cutting over chips, consider changing your toolpaths or use flood coolant if possible to keep things clear. Even though you’re using a reduced stepover, make sure you are still taking a chip. If you’re not making chips, the cutter will be just rubbing on your part, which can lead to odd tool marks and a bad surface finish. When all's said and done, the demands and features of the final part will dictate the kind of surface finish you need on a mold. As with so many things in the world of machining, determining where you can (or can’t) compromise on various features of your part, as well as the time and effort that goes into the mold making process, will dictate a lot about your surface finish.